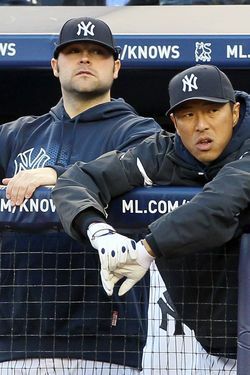 It's been just more than a year since Joba Chamberlain learned he'd need Tommy John surgery that would end his 2011 season and a little less than three months since he suffered a severe ankle injury at a Florida trampoline arena. He's made some public appearances since undergoing his reconstructive elbow surgery last year — riding on a float at the Thanksgiving Day Parade, cheering for the Rangers at the Garden, chilling with Spider-Man — but, by and large, he's been out of sight and out of mind for much of the past year. That the Yankees' bull pen hasn't really missed a beat — it remained a strength of last year's club after his operation and has performed well this year despite even more injuries — has made it that much easier to forget about Chamberlain. Anyway, we'd gotten the occasional update about his progress: Last month, for instance, he tweeted that he was ready to throw a bull pen session (though that came as news to his manager). And yesterday, Chamberlain told the Daily News that he believes he's two to three weeks away from going on a minor-league rehab assignment, and he envisions himself pitching for the Yankees in the second half of the season. He told the paper that his arm feels better than it has in a long time — "I essentially got a new arm," he said — though he doesn't know exactly how hard he's throwing because no one will let him see a radar-gun reading. That said — and we'll preface this by noting that this is about the most indirect sign of progress we can imagine — Chamberlain told the paper that he's liked the reaction of the coaches and catcher that have been working with him. Do with that information what you will.